In the early 21st century it was discovered that melamine foam is an effective abrasive cleaner. 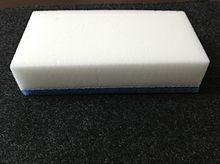 The open-cell foam is microporous and its polymeric substance is very hard, so that when used for cleaning it works like extremely fine sandpaper, getting into tiny grooves and pits in the object being cleaned. On a larger scale the material feels soft because the reticulated foam bubbles interconnect. Its structure is a 3D network of very hard strands, when compared to the array of separate bubbles in a material such as styrofoam. Rubbing with a slightly moistened foam may remove otherwise "uncleanable" external markings from surfaces. For example, melamine foam can remove crayon, marker pen, and grease from painted walls and wood finishings, plastic-adhering paints from treated wooden tables, and adhesive residue and grime from hubcaps. If the surface being cleaned is not sufficiently hard, it may be finely scratched by the melamine material. The foam wears away, rather like a pencil eraser, leaving behind a slight residue which can be rinsed off. The material is also sold as an effective dental stain remover for personal use. It is however warned to not use it on dental fillings as their surface may lose its shine. ^ "HowStuffWorks "Melamine Foam"". Retrieved 13 May 2012. ^ "Mr. Clean Magic Erasers: Creative Uses For These Household Cleaning Blocks That Truly Work Magic! - The Fun Times Guide to Household Tips". Retrieved 13 May 2012.